At PCE Instruments (PCE), you will find a wide range of weather station options. A weather station can be used for measuring humidity, temperature, wind speed, air pressure and dew point outdoors as well as indoors. PCE offers different weather station models in handheld or tabletop formats. We also carry environmental and climate monitoring equipment for industrial applications. PCE weather stations have myriad usages. Many PCE customers use our weather stations to monitor their construction sites to ensure worker safety as well as to determine suitable equipment operating and material installation conditions. Other PCE weather stations are used inside warehouse facilities to verify that proper product storage conditions are being met. 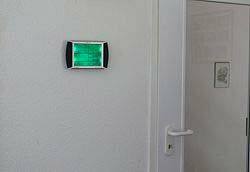 Inside private homes, PCE weather stations are used to assess humidity levels and evaluate heating, ventilation and air conditioning (HVAC) system performance. If you have any questions, please contact us at or Phone: +44 (0) 2380 987 035 for PCE Instruments UK, or or Phone: +1 (561) 320-9162 for PCE Americas Inc. The weather station Lufft WS10 measures 10 parameters simultaneously. The weather station measures temperature, relative humidity, air pressure, wind speed / direction, precipitation amount / intensity / type, UV index, sun position, brightness and twilight and global radiation. The weather station WS10 is ideal for building automation, smart city applications, and solar roofs. The data transmission takes place via W-Lan or RS485. The PCE-FWS 20 Weather Station is a multi-functional wireless digital device that will exceed your expectations. This manufacturer-calibrated meteorological instrument accurately measures temperature, relative humidity, precipitation, atmospheric pressure, wind speed and wind direction. Featuring a free-standing or wall-mountable touchscreen LED display with backlight, the PCE-FWS 20 makes a fantastic gift. - Precipitation indicator for 1 hour, 24 hours, 1 week, 1 month. The Weather Station combines various functions and sensors in only one instrument: Air Humidity Meter, Wind direction, Wind speed, Temperature meter, rainfall, and data logger. Furthermore, the meteorological station has different alarm functions and settings for the measurement parameters. The measured data can be sent by radio to the base unit (max. distance of 100 m). This test instrument is equipped with the latest technology used in meteorological analysis. The touch screen allows you to recall data onto the screen easily. The weather station PCE-WL 1 is an ideal tool to measure and store the wind speed over a long period of time. The battery operation enables you to use the weather station for mobile applications. Since a wind power station is an expensive investment, you usually want to know what profits it will generate in advance. The weather station PCE-WL1 helps you determine these profits. - 512 MB microSD card incl. The PCE-FWS 20 Weather Station is for private and professional use. This meteorological station allows the accurate detection of wind direction, wind speed, temperature, relative humidity and precipitation. The USB port and the included cable allows transmission of data from the device to a computer. Software for analysing data is also included, which enables you to analyse and check meteorological fluctuations, presenting data in graphs and diagrams for measurements over prolonged periods of time. The Weather Station PCE-WL 1 is an ideal tool to measure and store the wind speed over a long period of time. The battery operation enables you to use the airflow meter for mobile applications. Since a wind power station is an expensive investment, you usually want to know what profits it will generate in advance. The Weather Station PCE-WL 1 helps you determine these profits. PCE-WSAC 50 is a weather station that displays the current wind speed as well as the average wind speed of the last 2 and 5 minutes. This weather station allows measurement of the slightest wind movements. PCE-WSAC 50 is used for a variety of wind monitoring applications in industries such as construction, mining, renewable energy and manufacturing. Analogue Weather Station for indoor use (barometer, thermometer, hygrometer), made from carved out and painted slate. The analogue Weather Station Domatic Slate comes with a modern design and three well-readable round displays. This is for companies that want to include a weather station in their official pool of test equipment according to ISO and for annual re-calibration. This certification according to ISO includes a laboratory calibration including a test certificate with all measurement values. The name and address of your company or the company on whose behalf you order are also written on the certificate. The sensors of the weather station are long-time stable, which means that regular calibration for private users is normally not necessary. For professional use, we can make some adaptations where necessary (retrofitting of the sensors, extension of the cables, sinter filters, …). If you have a specific measuring application or problem, please contact us over the phone. In cooperation with our engineers / technical staff, you will be able to find a satisfactory solution. The weather station consists of various meters all of which measure meteorological parameters and thus can be used to observe the weather. Weather stations are frequently used for public weather measurements and forecasts but also for private purposes. A distinction is made between analogue and digital weather stations. An analogue weather station is common in „weather shelters“. These are small boxes, wither made of wood or of weather-proof plastic. These boxes do not only protect the measuring instruments from rain and dirt but also ensure correct measurement values. The weather shelters are made of wind-permeable slatted walls and are painted in white on the outside. This prevents the temperature data from being falsified by sun radiation. When there is sunshine and some clouds, a dark surface would absorb more radiation, emit it to the air inside and thus increase the inside temperature as compared to the outside temperature. This means that under these circumstances, a weather shelter would always record excessively high temperatures. To make the data of the individual weather stations comparable, it is defined that they have to be set up exactly two metres above a lawn and ten metres away from the next tree. It is also important that the sun can shine on it all day and that the wind can freely strike it. In most cases, weather stations consist of a psychrometer, a maximum and minimum thermometer and a thermo-hygrograph. Also, a rain gauge and an anemometer are placed outside the weather shelter. Modern weather stations also measure global radiation, sunshine duration and some special values such as evaporation and soil temperature. Analogue weather stations do not need power supply and are easier to read out. The user can also make further observations such as the course of the weather, which would not be possible with an automated weather station. The disadvantage is that the weather data can only be recorded in certain time intervals and can only be read out manually. What is the relation between the barometric pressure shown on the weather station and the weather? Different air pressure conditions (weather station will show related icons or numbers) are due to air masses that rise at different levels at different places on earth. This happens all the time as the sun always heats up the earth / the air at the equator more strongly than the air on both poles. The solar heating is gradually weakened from the equator to both poles. However, the air risen at the equator must go down somewhere and that happens at places which are a bit farther away from the equator, where the air is not heated up that much. The air pressing downwards, which rose up at the equator and were pushed away sideways, cannot compete with this air. In these areas, it rarely rains as the falling air masses get warmer when pressure rises and this prevent any cloud formation or dissolve all the clouds. Therefore, there are three large systems of rising air masses up to the poles and further north or south, there are falling air masses. The wandering low and high pressure areas emerge through earth rotation. When air masses rise, there will be a negative pressure for a short time at the place where they used to be. Air (wind) flows in the direction of the low pressure area from all directions. It can be summarised that in a low pressure area, air rises, which results in cloud formation as the gaseous humidity in the air tuns into small droplets in the air that becomes colder as it rises (the weather stations will indicate cloud formation and rain). A high-pressure area means the opposite: The air on the ground must get away from the high pressure, in all directions (weather stations will show wind). In the high pressure area, the huge air masses will descend extensively (which will cause high pressure at ground level). Due to the decent, the air will become warmer and the increasingly warm air can absorb more gaseous humidity which will solute clouds. The result is a blue sky and sunny weather. Lots of weather stations use air pressure for weather forecasts and additionally show the air pressure. Watching weather data using a weather station is not only important on a global but also on a local level. This can range from a simple display of the current weather data, long-time observation and analysis of recorded weather data to the reaction to certain values being fallen below or exceeded. All this is possible with the weather stations when used along with a software for operation and evaluation and the interface. The possibilities of application of the weather stations thus range from private applications to commercial use, e. g. by farmers and foresters, boatmen, shipmasters, the water management industry and organisers of open air events. These can measure the inside temperature and air humidity but also use various sensors such as rain gauges, wind direction indicators or wind speed sensors that are available with the weather stations. 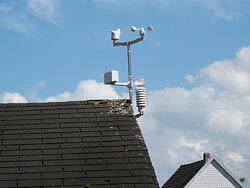 The wireless sensors of the weather stations normally have a reach of up to 100 m (open field) and thus allow totally free and flexible installation. The power supply of the sensors is provided by batteries in most cases. All used sensors are automatically recognised by the weather stations and can therefore be used immediately. Whereas the weather stations continuously show the current weather data and weather developments (e. g. barometric pressure tendency) in large displays, the data can at the same time be recorded and analysed via the evaluation software. To do so, all readings are transferred to a PC / laptop via an interface. Thus, weather stations enable anyone easy and comprehensive observation and analysis of weather data as well as the ability to react to certain weather conditions. There is another easy possibility to watch the weather in a certain place which is very popular nowadays: webcams. Nearly any city has several of these. They can easily be found via search engines on the internet, by typing in the relevant place, followed by „webcam“.